What is that Cobweb Cloud on Your Lawn? It’s that time again in the Akron, Cleveland, and Columbus, Ohio region where we’re in the two H’s: Hot and humid. Granted, we can get out of these summer days by staying indoors with air-conditioning. But what about your lawn? It has no escape and it’s susceptible to lots of fungi diseases from June through August. If you’re an early bird, and you’re out in your yard before you head off to work, do you see cobweb clouds on your lawn? Learn more about this fungus that can harm your lawn. It could be Pythium Blight (Pythium aphanidermatum) and it affects grass during very humid and hot days and nights. It starts out with an oily patch of grass that looks orange. Then, the fungi proceeds to kill the grass where the blades look brown in spots. Your lawn is made up of bentgrasses, bluegrasses, fescues, and ryegrasses, which are susceptible to Pythium Blight. 5. Call your local lawn care company to apply fungicides to diseased areas of your lawn. 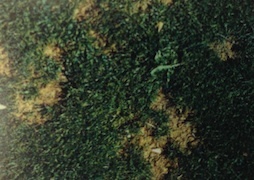 Ohio is the heart of it all, especially when it comes to lawn diseases. With so many of them out there, what's a homeowner to do? Not to fret, Weed Pro has put together a guide with the most common Ohio Lawn Diseases! The best part is that this guide, packed with a whole lot of info, is yours for FREE by clicking on the button below!